Hello, yes, I’m still alive – frankly just extremely busy trying to survive my MA course. I mean it is fun, but I feel lucky if I get to leave the flat at least once a week nowadays. But I’ve come back to try and bring back you lovely readers, especially because Christmas is approaching fast, and well, that’s my time to shine. None of the last year’s duck business this year though. Strictly cookies and truffles and… well… we’ll see I guess. So this time I was strong. And that’s all it took. Here’s how to make a delicious, baked, vegetarian muffin. Drain the mozzarella and cut into small cubes. Take your tomatoes and carve out the insides – seeds, core, juice, until all you have is a hollow case. Season the inside well, especially with salt, as this will drain the moisture and give you a more firm case. Squeeze a bit of garlic paste into the tomato and smear it on the bottom. Then, start packing your mozzarella. 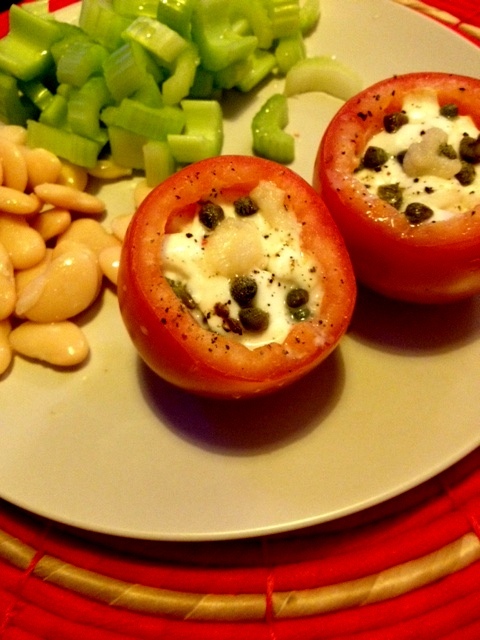 Halfway up the tomato, insert a handful of capers, then keep packing your cheese until the tomato is full. Drizzle the top with olive oil, add a couple more capers and season with pepper. Salt at this point is not necessary, because the capers will do the job just fine. Now came the clever part: since my tomatoes refused to stand up straight, I popped them into a muffin tin. A bit more olive oil drizzled on top and they were ready to be baked at 180 degrees; I also put on the grill on medium to get a nice colour on the top. Honestly, this dish doesn’t even count as vegetarian. At least to me, if there is cheese involved, it is automatically acceptable. I mean, bring on the halloumi and melted brie or reblochon, and I’m happy. So when these babies came out of the oven, I squeezed a bit more garlic paste on top and that gooey inside with the warm but firm outside made a fantastic dinner. It really is just mozzarella and tomato, just presented differently – not only is it healthy, it is also super quick. And I got to stuff my face with cheese, which is always nice. Anyways, there are tons of recipe pictures that I’ve taken over the past couple of weeks, and they’re just waiting to be shared, so expect more to come. And then we’re entering Christmas cooking week, and that’s the best. 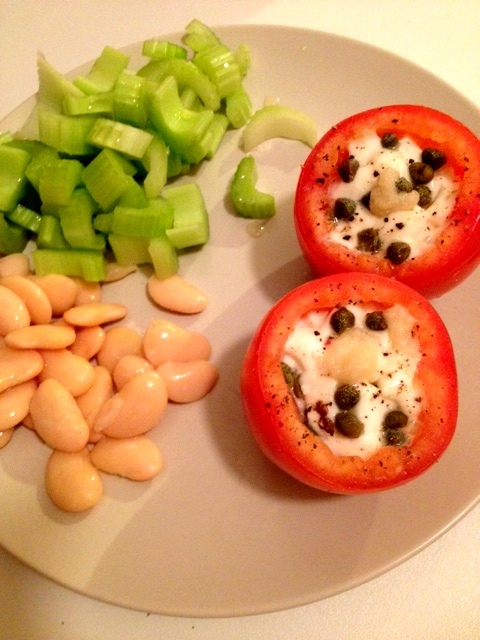 This entry was posted in Blog, Main meals, Snacks and tagged cheese, cooking, dinner, easy, food, ingredient, meal, mozzarella, quick, recipe, tomato, vegetarian. Bookmark the permalink.